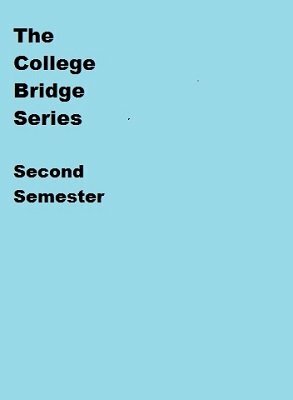 Originally I had planned to integrate match point play and full 2/1 Game Force system features into this batch, but I've decided to hold those things for 3rd Semester. So, my students won't be asked to play in a local club just yet. This semester finishes modern Standard American bidding including many gadgets which are common to 2/1, so next semester won't be that difficult of a transition and students won't be lost in online team competition. I've also included some work on declarer play and defense, including standard lead and carding methods. I rely heavily on reading assignments. There simply isn't enough class time to cover everything in detail. Some assignments are from books students must purchase, others are from the web. Remember that these lessons are free, courtesy of our friends at Lybrary. Much of the work is mine, but the foundation is from works previously donated to the bridge community by ABTA and other bridge teachers, and from published works by Eddie Kantar and other authors. Any attempt to sell this material would violate their copyrights and the spirit of their work for the good of our game. If you adapt this for your own lessons to paying students please donate a portion of your net income to your Unit's college outreach fund. 1st edition 2016, 86 pages.